I first heard of Alial Fital (Ah-lee-all Fit-all ) through The Hackers Paradise, a golf forum I frequent often. Having been created in 2010 by retired NFL quarterback Gibran Hamdan I was intrigued by a company that specialized in one-of-a-kind - Limited Edition Dress Polo shirts that combine the style of a dress Shirt with the comfort of a polo. So when they contacted me to try out one of their polos I looked forward to the chance of testing one of their polos out. The polo I received was the Castle Jazz Golf Polo in size large. The golf shirt is more of an athletic fit. I found it to fit perfectly. 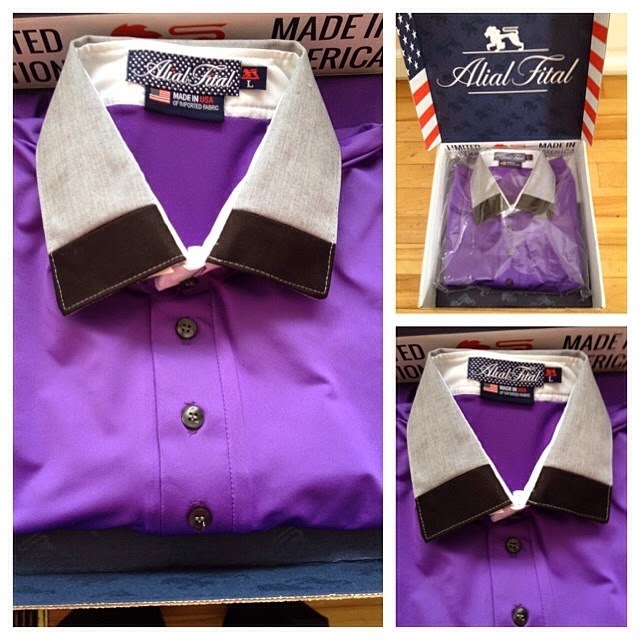 Alial Fital goes all out in the packaging and presentation of their apparel. The lightweight fabric (-92% Micropoly / 8% spandex base layer) that Alial Fital used was perfect for warm golfing weather. You hardly feel like you have a shirt on it’s so lightweight. The polo was outstanding when it came to moisture wicking properties, great for those hot days of playing 36 holes in a summer golf marathon. The little details Alial Fital puts into their golf shirts are amazing. From the arm band accent in black cotton to the white cotton details collar stand, button placket and hem. Alial Fital has found a great way to use color, style and functionality to a new level. Some other pluses for the Castle Jazz Golf Polo is that’s it’s made in the USA. The shirt retails for $85.00 which is reasonable considering the quality of the materials in each polo as well as being limited in production to 100. The Castle Jazz Golf Polo washed great although I did find I had to iron the sewn-in collar and cotton placket of the shirt. For someone who is rather busy and doesn’t always have time to iron. It had me reaching for another polo for golf on occasion. You can always tell a great golf shirt from the initial feel of the shirt. From the moment I first put a Alial Fital shirt there was no mistaking the quality and craftsmanship that is put into this polo. From the fabric to the distinct details Alial Fital gets top marks for its Castle Jazz Golf Polo. It was a pleasure to play a few rounds of golf in this shirt. You will have everyone asking, who makes that shirt? Alial Fital is MADE IN THE USA and Proud Sponsor of PGA TourPro Bo Van Pelt.